I’m sorry for your loss. The holidays can be an incredibly hard time without the ones you love, which is why I agree with you that a vacation may be exactly what you and your children need this year. 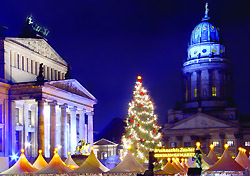 And Germany, with its festive Christmas markets, is the perfect place to get lost in the magic of the season. During the last days of November through the end of December, Germany’s small towns and big cities light up with holiday cheer. The streets are lined with markets selling Old-World crafts and goodies, while the heavy smell of mulled wine fills the air. Decorative twinkling lights dance playfully to the music of bells or Christmas songs spilling out of open church doors, and you might just catch a glimpse of Santa Claus if you’re lucky. Though it may seem too early to be thinking about the end of the year, you will want to start your research and planning now because the Christmas markets tend to be extremely popular, especially during the days surrounding the holiday. If you wait too long, hotels will be booked, prices will go way up, and your options will become fewer. By starting now, you can not only save money, but have your choice of where to stay. Every city celebrates a little bit differently, so you’ll want to research where you want to spend your holiday. For instance, the Dresden Striezelmarkt dates back to 1434, and includes the Stollen festival where a giant cake weighing about 8,800 pounds is paraded through the city streets before being cut and distributed. Berlin is a shopper’s delight, with more than 60 markets offering everything from unique stocking stuffers to handmade gifts. Smaller towns like Rothenburg provide a more intimate experience, with events like decorating gingerbread houses and reading Christmas tales. In almost every city, you’ll also find a range of festive concerts, plays, and activities happening throughout the month. Once you’ve narrowed it down to where you want to visit, you can then book your airfare. It’s always wise to compare prices to be sure you’re getting the most bang for your buck. I priced round-trip tickets from New York City to Berlin starting at $543 for the end of December. Even visiting a smaller town, be sure to locate the nearest international airport and price train tickets to your destination. Or you can rent a car, which might prove to be more economical if there are several of you traveling together and you are planning on going to a few different cities. Now that you’ve booked your transportation, you can focus on the fun part of finding a place to stay. Start by reading other travelers’ reviews on our sister site TripAdvisor, where you can search for a specific destination and find its top-rated hotels and B&Bs. Many of the city’s tourism websites will offer discounts and packages for the Christmas markets, but you may have to wait a few more months before they are offered. You can also contact Germany’s convention and visitor’s bureau to request information on promotions. Though you may have to wait to book hotels to get the best prices, don’t wait too long and keep a close eye out for available deals. If you want to book today, you can find rooms at a four-star hotel in Berlin starting at about $60 per night over Christmas. Other cities offer similar prices at hotels, but you can also opt to rent an apartment for about the same price or less per night. Plus, you will have use of your own kitchen if you decide you want to cook instead of dining out. Another option is to stay in a B&B, which almost guarantees a more intimate cultural experience. You may end up spending a little more than some hotels, but the friendly atmosphere and homemade breakfast each morning is typically worth the extra cost. I wish you the very best this holiday season and throughout the year. Please let me know if you have any further questions or what you decide to do. As for my other readers: Can you be my little helper and tell us where you think is the best place to go to celebrate Christmas in Europe? Is there a particular market in Germany or elsewhere that captures the season perfectly? Share with Unchained and other readers what you think by filling out the form below.